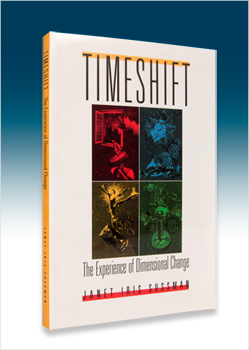 Timeshift takes us on a voyage into the fabric of time that illuminates our consciousness. Timeshift takes us on a voyage into the fabric of time that illuminates our consciousness. It describes the process whereby time and matter are created. Our perception of time colors our most intimate perception of Self. Timeshift opens our awareness to the subtle dimensions of time. Freed from past limitations on human experience, we participate in the massive shift in planetary consciousness. The planet, liberated from the constraints of time bound reality, will break free and become a portal through which human life can reinvent itself.